Remember the hottest taco chip challenge? It was a single big taco chip coated with world’s hottest pepper and made for many great videos where you saw people getting knocked out by a mean pepper. There’s now a new hot pepper challenge, The Death Nut Challenge. These are five handfuls of XL Virginia peanuts with an increasing heat level for each portion. The nuts are combined with the world’s hottest peppers: Carolina Reaper Peppers, Ghost Peppers, Chocolate Bhutlah, 7 Pot Brain Strain, 7 Pot Douglah & The Moruga Scorpion. 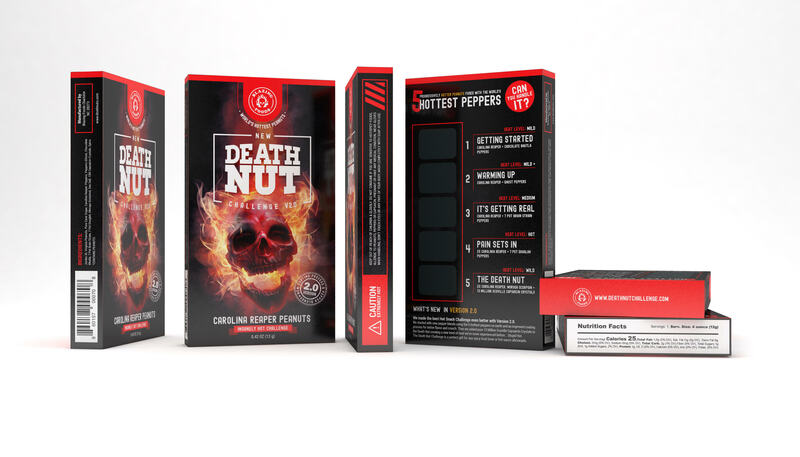 #5 The Death Nut: 2-X Carolina Reaper, 2-X Trinidad Moruga Scorpion Peppers and a sprinkling of 100% pure all natural 13,000,000 Scoville Capsaicin Crystals to make things interesting. I’m up for the challenge, where can I buy the Death Nuts? 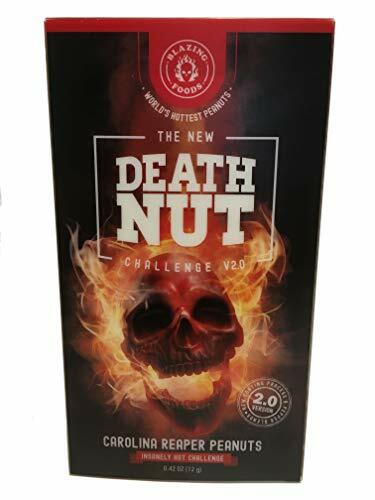 Buy the Death Nut Challenge 2.0 on deathnuts.com or on Amazon for around fifteen bucks. The best Carolina Reaper Pepper based spicy, hot food challenge available. Way more fun & intense than the 1 tortilla chip challenge! Version 2 picks up where Version 1 left off! Our chili-heads spoke and we listened to thousands of customers providing valuable input and insistence to create a better challenge! We started with all new pepper blends using the 6 hottest peppers on earth & developed a new coating process to improve flavor and crunch.